Power creeped Bloodfen Raptor. Both it and River Crocolisk only had the beast tag going for them, now they both have an objectively better card, not even hunter or druid would use them. I always thought it was a crinkled cigar! wait so the joke is they made his hands bigger for today? wut? Eh, more like "Deal 1 dmg to enemy hero" whenever I use it. One day. Someone will be down to 1 life, have many, many taunts, and will die to this card. Or 3 life and the Toad is in a Hunter deck. That flavour text pun though! Croak is a slang for death. 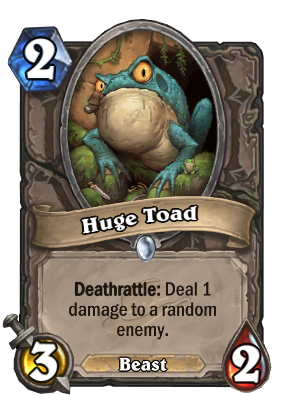 So deals damage when he croaks can mean it literally or as his Deathrattle. It's pretty brilliant!